There once was a time when traveling circuses roamed the earth, supported by the patronage of wealthy benefactors. Sometimes the shows received good marks; sometimes performers were booed off the stage in the middle of their act. But one thing was certain: life was always interesting. And there were ducats to be made for enterprising show managers. 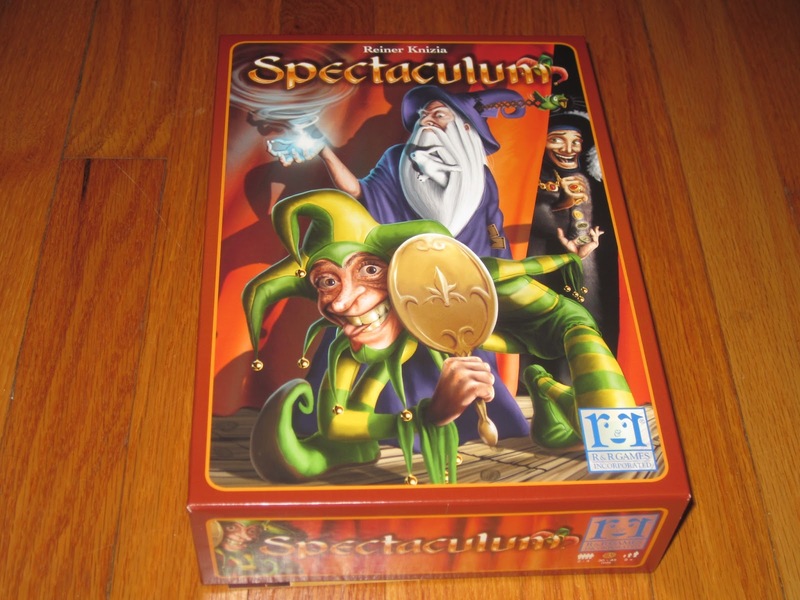 Spectaculum seeks to transport players to this world of entertainers and circuses through a game of stock manipulation. Is it worth the price of admission? Find out below! Spectaculum is a stock-manipulation game for two to four players set in the world of traveling circuses. Players alter the prestige (value) of circuses and hire and release entertainers (read: buy and sell stock) to earn ducats. The player with the most ducats at the end of the game wins. This is how the board looks at the start of the game. 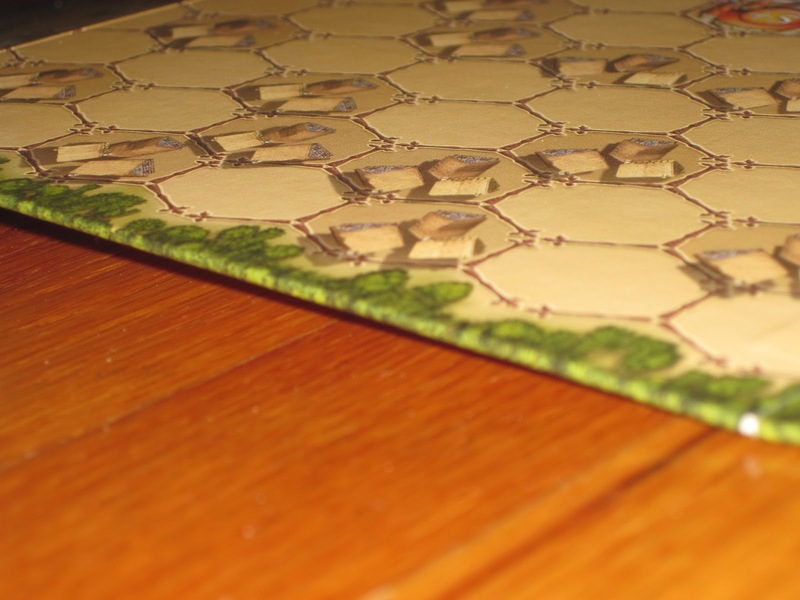 Note that the village markers on the board are cardboard and are randomized for each game. Each player begins the game with 20 ducats, an entertainer of each color, and three travel markers. (Entertainers hired is open information; ducats and travel markers are concealed.) 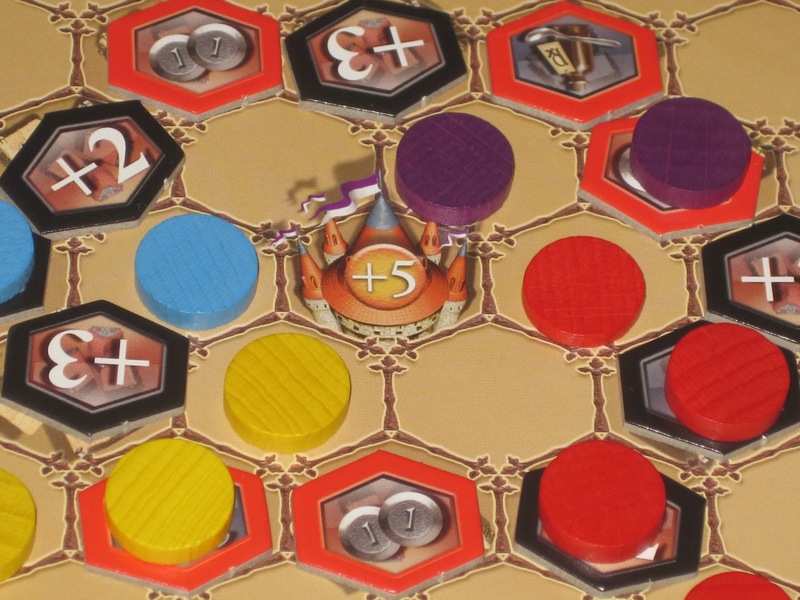 Players randomly place the village tokens on the board on the spaces indicated, and each circus’s value marker is placed on the start space on that circus’s value track. The player who most feels the strength of the strong lady coursing through his or her veins begins the game. On a turn a player may perform two entertainer actions (hiring and/or releasing entertainers), must place three travel markers on the board–connecting either to the corresponding color’s circus tent or a marker of that color already on the board–and then draws three new travel markers for his next turn. When players place their travel tokens on village markers, the village markers affect the values of that circus’s performers or give bonuses or penalties based on the number of entertainers in a player’s employ. Entertainer actions may be performed before and/or after the three travel actions, but the travel actions must be taken in succession. The capital is in view–but which circus will win the glory of performing there? The game ends when one circus reaches the kingdom’s capital and all but one of the bonus/penalty spaces is occupied with travel markers. Players earn ducats for each of the entertainers in their employ, and the player with the most ducats wins. I don’t often get the itch to design games, but I sat down once to design a game of buying and selling stocks with a heavy dose of player interaction through stock manipulation. It was going to be great. Then I played Spectaculum. Spectaculum accomplishes everything my game set out to do in less time and in a simpler, more compelling way. So much for the creative itch. The art on the cards is great, but the only game-important element is the card’s color. Spectaculum, despite its promise of immersion “in the colorful world of fortune-tellers and snake dancers,” is a straightforward stock market game that’s easy enough to play with your family but compelling enough to sustain interest through many plays. I like the game quite a bit, just be warned: don’t expect immersion in a world of traveling circuses. This game is stocks with pretty pictures. 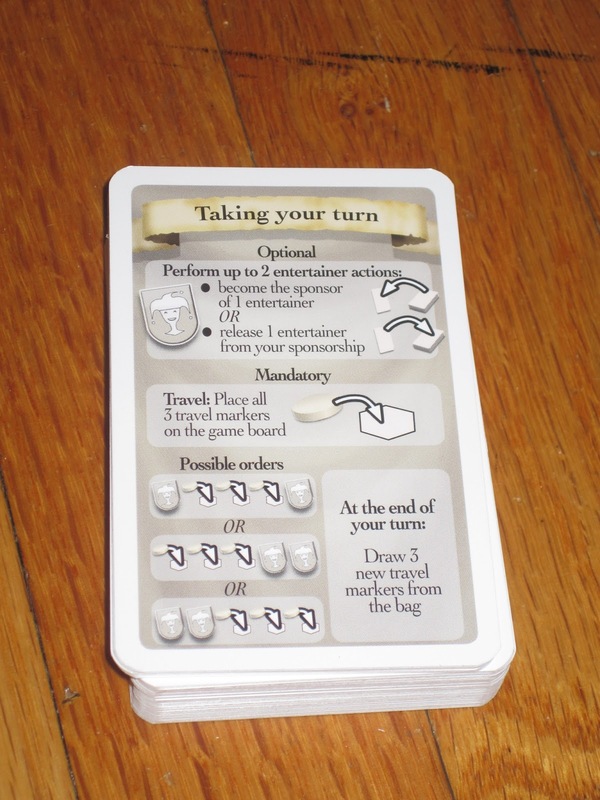 The game, while simple, comes with handy player aids for each player. The first thing to like about Spectaculum is that the game is simple. I’ve had no trouble explaining Acquire, another stocks game, to my family and friends, but that game can be brutal and unforgiving to new players. (See: my first experience.) Its unforgiveness comes in the dearth of options available if players invest their money poorly, something that’s easy to do because of all the information that players are allowed to keep secret. Spectaculum, however, is fully explainable in less than five minutes. More than that, it’s easy for new players and old to fully grasp the choices they’re making. Most of the important information that players need to know to make wise decisions–how many of each stock each player has, the likely future landscape for stock options, and the current value of stocks–is fully available. And the circuses’ value tracks and the village abilities are well laid out and clear to players from the start. I also like how the game’s limitations focus the decisions players make. For example, it can be fairly easy for players to see which circuses will increase in value and which ones will decrease. However, players have only two entertainer actions each turn, so buying and selling stocks becomes a balancing act. Do you buy and sell the same stock in a turn to make a quick profit, or do you buy an opportunity likely to pay off later? The limited number of stocks for each circus focuses this decision even more. There is also the uncertainty of the travel markers you and other players will draw. You may want to increase the value of a circus, but if another player draws the travel markers, that player is in control of the value. This makes the game highly interactive, giving players things to watch and care about on all the players’ turns. The travel markers are nice wooden discs, pulled from the drawstring bag. Spectaculum is a game that’s all about timing: players must buy low and sell high in order to win (obvious). However, the addition of the illness and pay day spaces adds an interesting twist to the game. Beyond stocks’ values, players must also consider what the payout and loss will be if a circus lands on the special spaces. A stable full of valuable entertainers is great, but an illness at the wrong time can be costly whereas a pay day at the right time can be a huge boon. This encourages players to control the number of stocks they possess beyond what their net value will be. 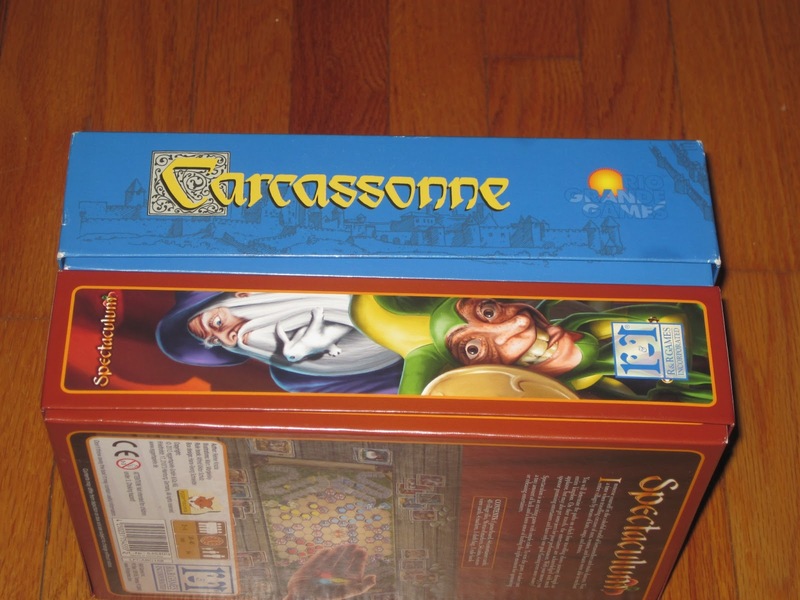 The game is in the same size box as Carcassonne. It’s very portable, another thing that recommends Spectaculum as a lunchtime game. Spectaculum is not without its flaws. The thing that may be a turn-off to gamer types is the luck factor involved in the travel markers. 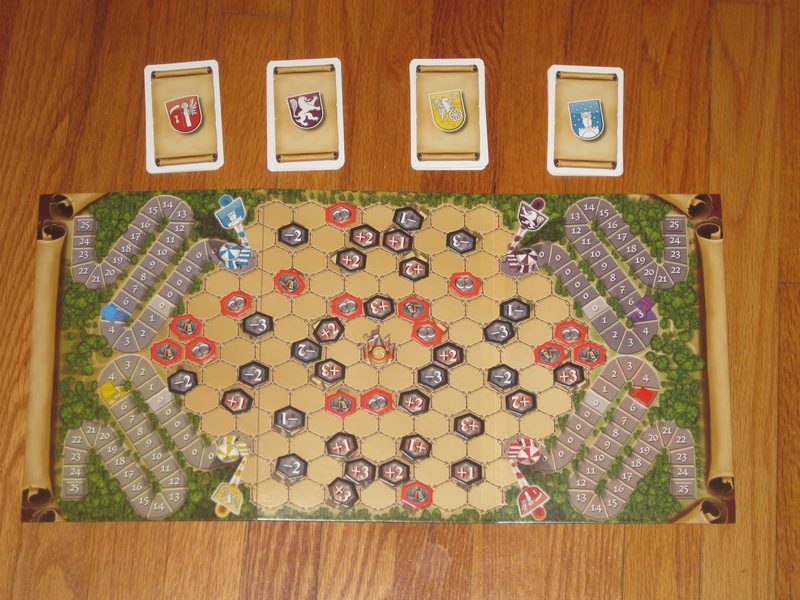 The game lays out most of the information for players, but the travel markers, while the only truly random portion of the game, can provide a huge swing in the control of the game. 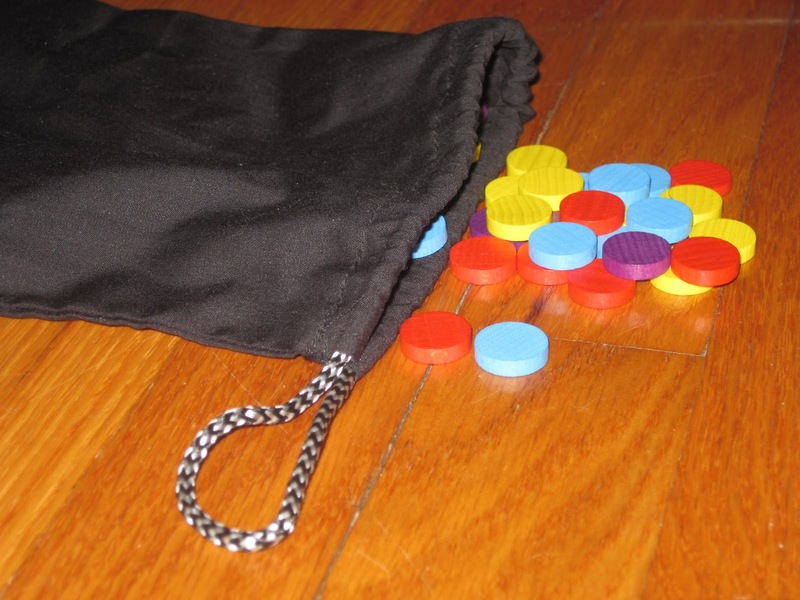 Players can only manipulate the stocks for which they have travel markers, and these markers are drawn randomly from a bag. I don’t mind this luck (it’s one of the things players have to contend with in an otherwise open-information game), but I know it will frustrate other players who prefer a more cerebral experience. I should note, however, that the swings in luck due to travel markers are more prevalent the more players are at the table. It is much easier for players to plan ahead in the two-player game than the four-player game, but again, I don’t think the four-player game is worse for that. I think Spectaculum is fun with any of the numbers prescribed on the box. This is the board. Even after I tried to smooth it out, it refuses to lay flat. All of my other “complaints” about Spectaculum are purely cosmetic. First, the game’s name. It’s not very evocative for players, at least not what the name is intended to convey. The game’s art is inviting, but it doesn’t take long before players realize that the art and dressing have very little to do with the game itself. As I mentioned earlier, while the card illustrations are very nice, the cards could have shapes or even simply colors and convey the same information they do with the art. The travel markers and drawstring bag are a nice touch, and the coins and village markers are on good cardboard. 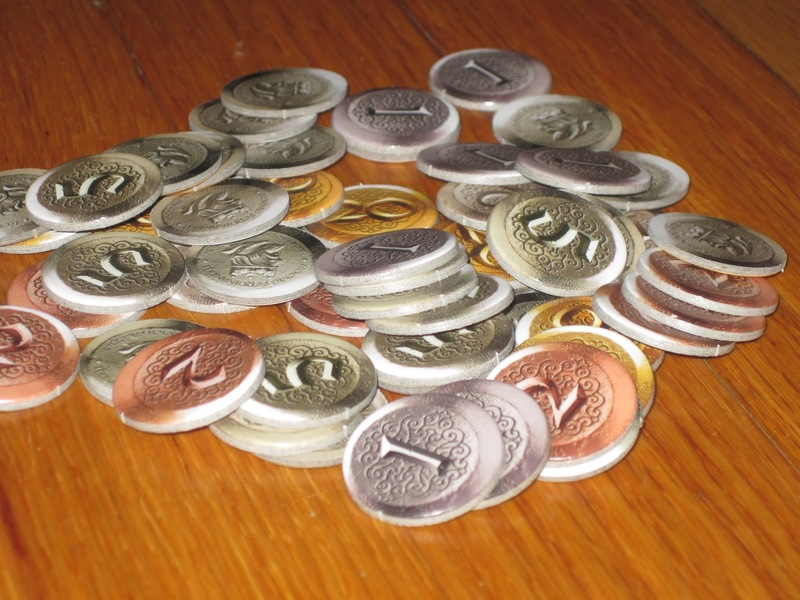 However, there is a shortage of coins for the four-player game. Well, technically there are enough coins, but only if players constantly make change. The problem with this is that the money is intended to be hidden information. When players make change with the bank, it reveals their score–or at least a part of it–to the other players, and it can be taxing to have to remember which coins are which values in order to pay and make the trades. This aspect of bookkeeping is a little annoying, but not a deal breaker. Still, I thought more than once that more coins and player screens would have been welcome additions. Also, the board does not lay flat. Thankfully, the pieces don’t move around because of their heft. The coins are nice. I wish there were more included with the game. There isn’t much that’s new or innovative about Spectaculum, but that’s okay. It does what it sets out to do, and it does it very well. It provides an enjoyable stock market manipulation game that’s explainable and playable in less than an hour. In addition, the open information gives players a sense of ownership over their decisions, and while luck can swing the game, it affects all players equally, and there’s still enough information to plan. Spectaculum is not my favorite stocks game–that award goes indisputably to Acquire–but it has the advantage of being short and simple, a recipe for getting it to the table more often. 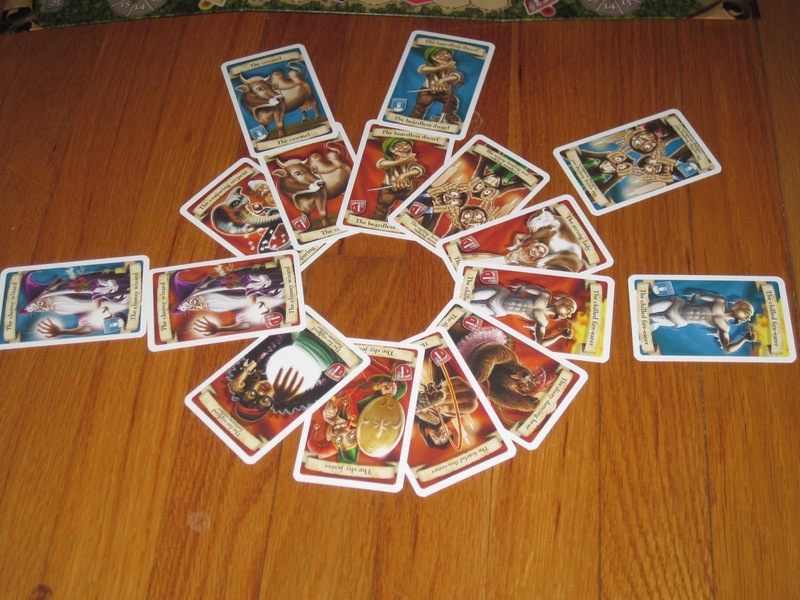 I wouldn’t buy this game if you’re really looking to “immerse yourself in the colorful world of fortune-tellers and snake dancers,” but if you want a lunchtime or family stocks game that offers interesting and tense decisions, look no further than Spectaculum. iSlaytheDragon would like to thank R&R Games for providing us with a review copy of Spectaculum.